Osteopathy is a system of diagnosis and treatment for a wide range of medical conditions mainly focusing on muscle and joint injuries and other painful conditions. Osteopathy is recognised by the British Medical Association and is based on the principle that the well-being of an individual depends on the skeleton, muscles, ligaments and connective tissues functioning smoothly together. The main aims of treatment are to help the body's own repair and adaptation processes to heal tissue damage, reduce pain, restore function and where possible to do so without the use of drugs or surgery. Treatment not only helps alleviate symptoms of the painful condition, but addresses the causative factors involved in creating the condition in the first place. The treatment also aims to prevent the condition from recurring, which may include postural and ergonomic advice to prevent strain and injury. They may also provide advice on exercise to aid recovery, promote health and prevent symptoms recurring. Initial consultation cost £45 and usually last around 45 minutes. Follow up half-hour treatments cost £40. Many private health insurance policies provide cover for osteopathic treatment. It may be possible to claim for a course of treatment but you should check in advance with your insurance company in order to confirm the available level of cover and whether you will need to have a referral from your GP or a specialist. Miad also has a BSc (Hons) Physiology, over twenty years experience in Martial Arts and physical training as well as several years experience as a tutor at the British College of Osteopathic Medicine in Hampstead, London. I have visited Miad on many occasions. I am a pathologist and spend long hours behind a microscope and it's not very unusual for me to suffer from neck muscle spasms, which can prevent me from working effectively. 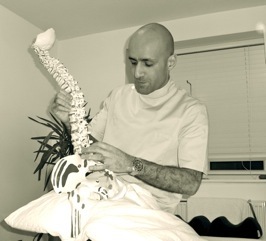 Miad's Osteopathic techniques have proven to be very effective for my complaints, he also gives advice on exercise and posture which have been very helpful in preventing reoccurrence of the pain and discomfort. I would certainly recommend him for musculoskeletal pains. I have suffered from constant back problems from sport and sitting for long hours (working in IT). Miad was thoroughly profressional and efficient in diagnosing the cause and treating it - plus recommended exercises to prevent the symptoms from re-occurring which has helped tremendously. Definitely worth a visit if tired of pain-killers!